Harold Feinstein Photographer – The Rolleiflex camera: Love at first sight. Someone once asked me what my favorite camera was. That’s easy. 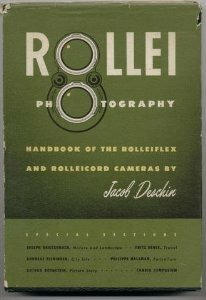 TheRolleiflex medium format TLR. In fact I would call it the most beautiful camera I’ve ever seen. It was relatively easy to use, light weight, extraordinarily well-constructed, simple and had the best lenses in the business. Everything worked again and again and again. Constant reliability, performance and excellence in a camera. I suppose the only objection some might have to it would be looking down into finder lens. But that never bothered me. As a medium format twin lens reflex with 2 1/4 x 2 1/4 (in) format, there are two lenses — the taking lens and the finder lens. You look down into the finder which is giving you a reverse image mirrored from the taking lens. You do see what you get with the exception of very close range photographs. Visually the square format is elegant and symmetrical, but also offers the option to crop either vertically or horizontally. And, the 2 1/4 film means generally better quality large prints than you can get with 35mm. The “seeking shade” photograph is, to me, stunning!! I love looking down into the big viewfinder, even when I’m not shooting any film – it’s like an alternate reality! Thanks for sharing your story with us, and hope to hear more from you!